Potatoes. We can’t say enough good things about ‘em because they’re just so good all the time! We love baked potatoes and french fries and gnocchi, but one of our favorite dishes happens to be creamy, cheesy potato soup. But not just any soup. Nope… this hash brown potato soup is absolutely our new favorite. Using store-bought hash browns (or homemade, if you’re really feeling ambitious) and lots and lots of cheese, we end up with a thick soup that warms us up and gets us excited for cold weather…. As summer, heat-loving fanatics, any soup that makes us feel even the slightest bit ready for colder temps is A-OK with us! Combine chicken broth and hash browns in a large pot or Dutch oven over high heat and bring to a boil. 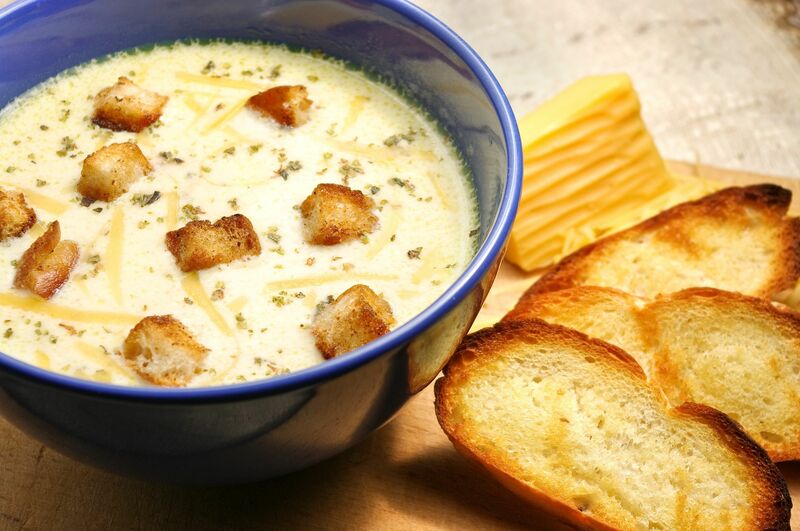 Reduce heat to medium and stir in chicken soup, cheddar cheese and onion powder. Season generously with salt and pepper and cook for 10-15 minutes. Stir in sour cream and cream cheese and cook until completely incorporated, then blend everything together (or leave as is). Transfer to serving bowls and serve topped with oregano, croutons and more cheese.